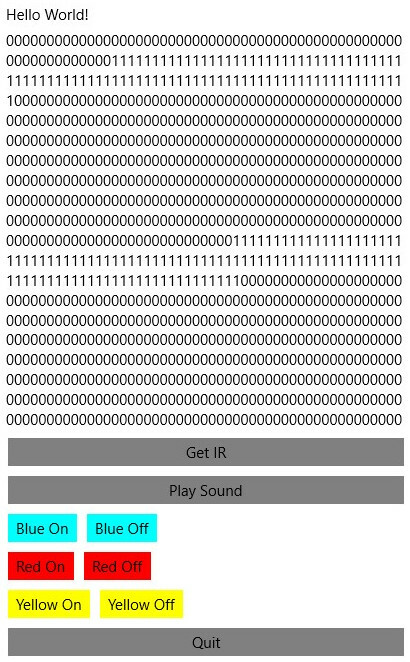 I created a [XamarinFormsIoT] Windows Core IoT project which can control LEDs and play sounds on a Raspberry PI 3 using C#/XAML. I used a portable dependency interface to expose the GPIO controller which only exists in the UWP project. GPIO is used to control the LEDs. I also ordered an IR receiver so I can detect IR signals from a remote and it works! Next I need to [find] a UWP library for LIRC. The [Arduino-IRremote] has a C++ library that can be converted to UWP. I followed the idea from the video below.